Every family has at least one family member who is the black sheep of the family (some families have whole flocks). The black sheep I have found in my family research is Amos Fuller. Amos Fuller (1721-1813) is my 5th great grand uncle. Amos was the 5th son of Benjamin and Tabitha (Wheaton) Fuller of Lebanon, Connecticut. The Fullers had just moved to Lebanon, CT from Rehoboth, MA the year before Amos was born. Amos fell in with a group called The Money Gang. His specialty was creating £3 Connecticut counterfeit notes. At this time in US history, each state had their own currency. Typically, this paper money was printed on a regular printing press, making anyone with a printing press a potential felon. Amos may have been criminal, but that didn't mean he was stupid. There wasn’t a lot of law enforcement coordination back before the revolutionary war, so he would go to other states to pass his counterfeit bills. However, even this strategy didn’t prevent him from being caught. He was apprehended passing counterfeit bills in New Jersey under the alias "Jeremiah Carpenter". At the time counterfeiting carried stiff penalties, with the longest possible sentence being life in prison. Amos Fuller found prison life to be a little too restricting for his tastes and actually broke out of jail. The details are sketchy, but the following report was published in the New York-Gazette on October 12, 1747. N.B. 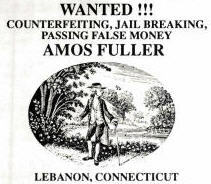 He is a New England man"
Amos “Jailbird” Fuller was never brought to "justice" and re-imprisoned. There is evidence the he spent much of his life misleading and defrauding people in the pursuit of easy money. However he did play an important role in the New England “Planters” colonizing Nova Scotia, but this is the subject of a future post. Who are the black sheep in your family? I still remember my grandmother getting the paper and the first thing she turned to was the obituary page. She wanted to see if it contained anyone she knew. I use obituaries in a similar way, to learn more about the family members that I wished I had known. For my family research, obituaries have been invaluable. I use a wide variety of documents such as: census records, passenger lists, birth certificates, naturalization records, etc. in my research. Perhaps none are better than obituaries. Why do I love obituaries so much? Nothing seems to connect the dots and help you find missing relatives better than a well written obituary. Here is a perfect example from my maternal Great-Grandfather, George Gula. Children: This can help you find living children's names, plus the spouses and married names of his daughters. Also, it tells you where they were living at the time, which can be invaluable when trying to track them down. Siblings: I didn't realize that George had a sister and that she lived in Connecticut. What a wealth of information! Where are the best places to look for obituaries? 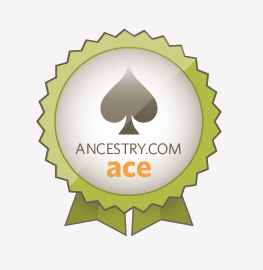 I have had a lot of success on Ancestry.com. However, not by searching in the Ancestry.com "obituary" section. I search under the "Newspaper & Publications" section. Ancestry.com has a nice selection of newspapers and look for a local newspaper for my ancestor. I choose a local newspaper (if they have it) and search for my ancestors name or sometimes just surname. Sometimes, I will use the keyword of “died” or “obituary” to narrow down the results. When researching my Maine family roots, I have had a lot of luck with GenealogyBank.com to find obituaries. They have a huge selection of newspapers from every state. When I have known exactly when and where my Maine ancestors died, I have turned to the Maine State Library. They have a service where they will lookup obituaries for you. The state of Maine State Library has a number of newspapers in their archive from all over the state and for a fee of $5 they will find the obituary or death notice (no charge if they don't find the obituary) for you. I have had a great experience working with them. Usually, they will email me and let me know if they were able to find the full obituary (which is probably worth the fee) or if it is just a death notice (which may not be). You can use this website to request an obituary from the Maine State Library. For me, obituaries have been a critical source of information. They can take a little work to track down, but the hard works usually pays off. We all know that Sea Serpents don't really exist. Just like we know there are no dragons, no mermaids, and no monsters. But 120 years ago, things may have been a lot less certain. It is said that when you are at sea that your mind can play tricks on you…how else can you explain sailors thinking that manatees, so homely they border on being cute, being confused for mermaids. However, when the men of the schooner Edward Waite of Portland, Maine sailing back from Cardenas, Cuba with a cargo of sugar, spotted something strange in the water...something none of them had ever seen before....it was something they couldn't keep to themselves. "Our voyage from Cardenas to Cape Hatteras was uneventful. We passed that point on the morning of the 14th, and we were more than half the way to Cape Henry when we sighted a strange disturbance in the ocean. It was my watch, and there were several men on deck at the time. We thought at first that it was a whale, but as it did not 'blow' we concluded that it was a large shark, although some of the men who were watching it said that it was too large for a shark. The thing, whatever it was, came nearer and nearer, as if charging for the vessel, and we began to get a little excited. We noticed also, as it came within a reasonable distance, that the things head was raised out of the water. It came nearer and nearer, leaving a long, wide wake behind it, and stirring up the water into foam like the paddles of a river steamer. It passed the schooner within less than 250 yards, and we had a full view. We were so much interested that I forgot to call the Captain, who was below asleep, but all of the watch saw the thing as plainly as I can see the schooner in the next dock. It was a sea serpent and no mistake. We could only measure its size by the line made in the water, but I should say that it was fully 90 feet long, with a head as large and something like the shape of a horse’s head. The most remarkable thing about it was the color and size of its eyes. They were of a bright saffron hue, and half as big as a man's hand. It held its head above the water all the time we saw it, which was about half an hour, when it passed out of sight in a southerly direction. We were at the time in latitude 35 degrees 40", and it was a clear day. We could have not been mistaken." What did they see? I can't think of anything we know of today which could fit that description. Is it possible they saw something that has been yet to be rediscovered by marine biologists? There is still so much we don't know about our oceans. Or was it the result of too much sun and too much rum which caused some sort of mass delusion? I can't be sure that my 2nd Great-grandfather, James Henry Fuller, was aboard at the time of the sighting of the Sea Serpent, but when doing my family research I wanted to look into which ships he had served upon. I am thankful to the help of David Dearborn from the Maine Maritime Museum, who was able to find out for me that James Fuller served as a mate on the Edward Waite during his sailing career. I will probably never know for sure, but I can imagine that he was one of the men to see and tell tales of Sea Serpents. I thought I knew where my 2nd Great-grandfather, James H Fuller, had been born and I wanted to see if I could find a record that definitively named his parents. So, I decided to see if I could get a copy of his naturalization records. Naturalization records (petitions for our ancestors to become citizens) are one of the best resources to find the birthplace of an ancestor and when they arrived in the US, but they can also be difficult to obtain. Ancestry.com has numerous naturalization resources, but at this time, has limited actual documents. The major challenge when tracking down naturalization records is that Before September 27, 1906, naturalization was carried out by thousands of courts—federal, state, county, local—and each court kept its own records. So tracking them down can be a daunting task. If you are researching ancestors who may have become citizens while living in New England, you have a big advantage. The National Archives office in Boston has obtained just about all the naturalizations from all of the New England courts (excluding Connecticut) for the time period between 1790 and Sept 1906. It is an interesting story on how all these records ended up in the National Archives. During the 1930's, it became a requirement to be employed in many of the "New Deal" government projects that you needed to be citizen. To assist those who needed to document citizenship, the Immigration and Naturalization Service (INS) used a "New Deal” project to photograph naturalization records of the various courts of Maine, Massachusetts, New Hampshire, Rhode Island, and Vermont. By 1961, the INS had no further use for these records and because they were copies they planned to destroy these copies of those original documents. The records were even loaded on a truck to be taken to a pulp mill near Haverhill, Massachusetts to be recycled. But because of the type of material used (called dexigraphs) they couldn't be used by the mill and were returned to the INS. A petition was sent to the local National Archives whether they would want the records or they would be destroyed. The National Archives decided to accept the records, so the paper mill’s loss is our gain. You can even order these records online. 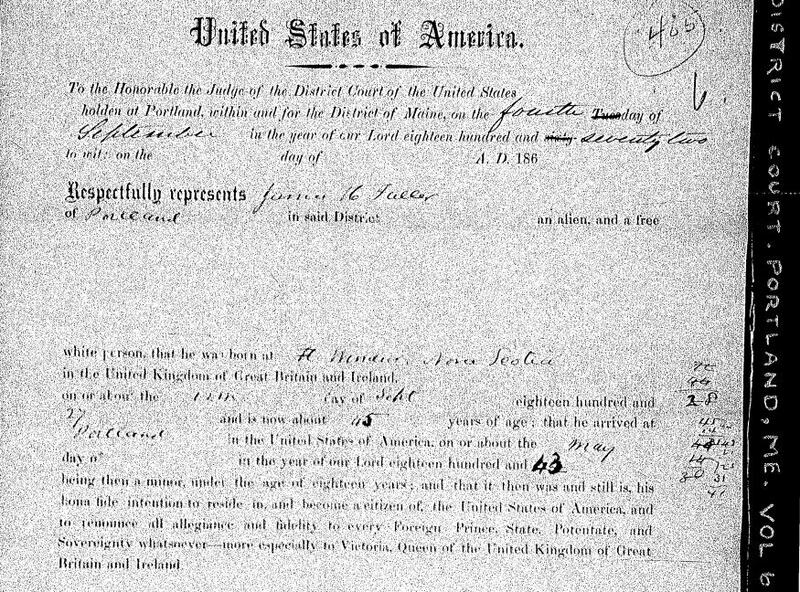 Here is an excerpt of my 2nd Great-grandfather, James H Fuller's Naturalization document (it didn't copy very well). It did confirm for me that he was born in Windsor, Nova Scotia, but unfortunately, it didn't name his parents. I think the newer versions of naturalization documents include additional questions such as name of spouse, spouse's origin, name of children and children's birthdates. It is also important to note that many immigrants to the US never became citizens. 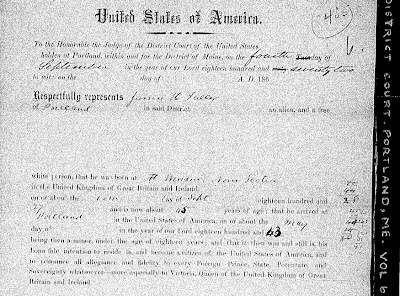 To have some idea when your ancestor became naturalized check US Census Records from 1900-1930. Each of these census records state whether the person is a citizen "Na" or alien "Al" and gives a date for when they became a citizen. How to request Naturalization documents from the national archives and what it costs? National Archives website for naturalization records can be accessed here. The cost to request a naturalization record is only $7.50 per record. I would love to hear your comments regarding any great information you have found on your ancestors immigration records. Thomas Woodbury is my 5th Great-grand uncle. He was born 9/5/1700 in Beverly, Massachusetts and died 10/3/1757 in Falmouth (now Portland), Maine. I believe this will was written shortly before his death in 1757. His last will and testament was the first family will document I was able to uncover. As I have said, Maine is a genealogists dream come true (I wish all my family had lived there). They have done such a thorough job of cataloging historical documents and making them available to the public. I have included a full copy of Thomas Woodbury's will. I was able to find this from searching an online Google e-book titled "Maine wills: 1640-1760 By Maine Historical Society". If you have relatives that died in Maine in that time period, check this out. I do recommend searching Google e-books, they can be an effective source of historical information. 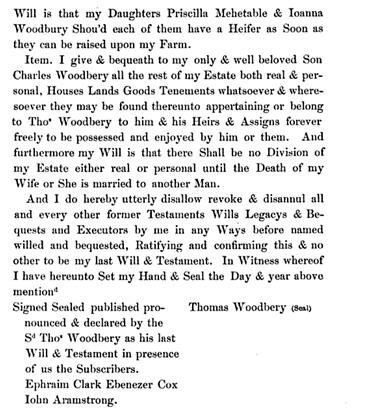 In addition, Thomas Woodbury's will is witnessed by my 5th Great-grandfather, John Armstrong. From the will you can see that Thomas Woodbury was pretty well off by the standards of the time. I especially like that he bequest each of his daughters, Priscilla and Joanna Woodbury, their own heifer. Nothing like a cow to remember daddy and show your love. The Civil War Battle of Portland, Maine?? Yes, that isn't a typo. The confederates actually made it to Maine, which caused quite a stir for those New Englanders who thought they were safely away from the civil war fighting. In June 1863, Lieutenant C.W. Read commanded a confederate ship named the Archer (a ship he had captured), which marauded off the east coast. He and his men intercepted American trading vessels and set about burning and scuttling them. Union forces were put on alert and at one point 40 ships were searching for them. With Union vessels everywhere scouring the seas for him, Lt. Read decided on the audacious plan of sneaking into Portland harbor to steal a steam powered ship. In the early morning of June 26, they passed into the port undetected. 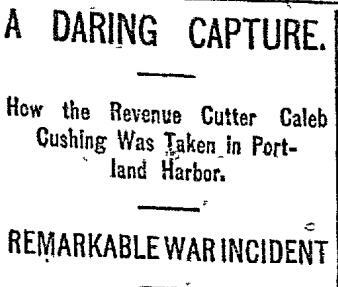 They failed in their pursuit of a steam ship, but decided upon the revenue cutter the Caleb Cushing. 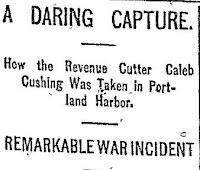 The Caleb Cushing was in port due to the recent death of their captain. As a result, the ship only had a skeleton crew on watch which was easily overcome by the rebel forces. 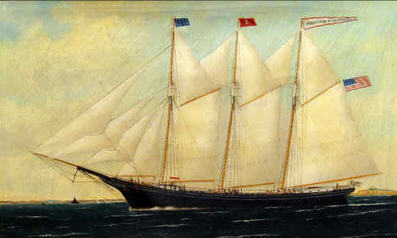 The Caleb Cushing was a two masted sailing craft. The rebels were able to exit the harbor without being challenged. By early morning, the alarm was raised and a group of union forces, including local men, were in hot pursuit. Two key events worked against Lt. Read and his men being successful in their escape. First, the fact that shortly after clearing Portland Harbor the wind died down and they were nearly dead in the water. Second, the fact that in their rush to escape they failed to realize that they had plenty of gunpowder, but almost no ammunition. Had the wind been with them or they had adequate ammunition they would have almost certainly gotten away. The Caleb Cushing was armed with a 32lb gun vs. the 2 brass 6 lb guns of the union ships. It wouldn't have been a fair fight, that is for sure. Lt. Read and his men abandoned the Caleb Cushing and set it ablaze which culminated in the dramatic explosion of the gun powder stores. They surrendered and were incarcerated at Fort Preble in Portland. Two of the union sailors in hot pursuit of the Caleb Cushing were my Great-great-grand uncles, Andrew Hanley Fuller and Collingwood Fuller. Both sailors served on the Caleb Cushing, but were not aboard at the time it was taken. Andrew H. Fuller's obituary includes the details of the excitement of this event. Special thanks to my distant cousin, Marc Brouillette, for providing me a copy of Andrew Fuller's obituary and telling me about the story of Andrew's part in the capture of the confederates that took the Caleb Cushing. To find more about the historic incident of the taking of the Caleb Cushing, I was able to find a variety of of archived articles from Geneologybank.com and at the Chronicling America Newspaper project from the Library of Congress. If you find out that your ancestor was involved in a historical event, these resources make a great first stop to find out more first hand knowledge of the event and how it was viewed at that time in history. It may be true the old saying that a sailor has a girl in every port. My Great-Great Grandfather, James Henry Fuller was a sailor living in Portland, Maine. He was a captain or first mate on commercial ships which sailed from Portland to Boston and New York. He was born 9/12/1827 in Windsor, Nova Scotia and was a commercial sailor from 1847-1905. These weren't steam or diesel ships, but the old three masted schooners powered by nothing but sails and wind. When not at sea, or possibly because of so much time at sea, James Henry Fuller was married 4 or 5 times!! He married: Mary Farr, Ellen Downey, Laura Freeman, Margaret Armstrong O'Hagen (she had been married before) and possibly Mary Newcomb. For Mary Newcomb, the "intention to marry" was filed with the City of Portland, but I can't find an actual marriage record, so they may have called it off before the wedding. It would appear the James H Fuller liked getting married, but may not have enjoyed being married quite so much. To be fair to him, diseases that we don't worry much about today like scarlett fever, measles and pneumonia claimed many people at a young age. It is likely several of his wive's died young and caused him to remarry. He married his last wife, Margaret Armstrong O'Hagen, when he was 55 years of age (12/31/1882). It was a good thing he did, because Margaret gave birth to my Great-Grandmother, Elizabeth M Fuller in 1886. He was 59 and still spent much of his time at sea. I don't think I would be up to being a father of a newborn at that stage of my life. Here is a copy of Maine Marriage record of James H Fuller and Margaret Armstrong O'Hagen. How did I uncover this information about the many marriages of James H Fuller? The State of Maine has put most of their birth, marriage and death records online. They are easily accessible on Ancestry.com. If you aren't a member of Ancestry.com you can also go to Mainegenealogy.net or Familysearch.org which offers the same state of Maine vital records. Yay! My Ancestor Arrived on the Mayflower.......Wait, Not So Fast! I started researching my family history about 6 months ago. My first step was to join Ancestry.com. Ancestry.com is awesome! The website has a huge amount of resources which make researching family genealogy much easier than having to do it all from scratch. It has literally enabled me to find out things about my family in the course of a few weeks or months that may have taken me the better part of a lifetime to find on my own. One of the best features of Ancestry.com is the "hints" that appear as a leaf on the person you are researching. These "hints" provide you links to documents such as census, marriage or death records. These can save you a lot of time and provide valuable hints to other family members. Another huge timesaver on Ancestry.com is your ability to see the Family Trees that other contributors have already created. It is fascinating that other Ancestry.com members who are distantly (sometimes very, very distantly) related to you have already been researching the same family members that are of interest to you. In a matter of minutes you can leverage all the hard work and research of other contributors. So within a few weeks of starting on Ancestry.com, I had leveraged the work of other Ancestry.com members to trace my family history to, you guessed it, several passengers on the Mayflower. Yes, tracking back to those hearty pilgrims who left England to come to the New World to seek religious freedom. Specifically, I learned that Dr. Samuel Fuller was my ancestor. He arrived at Plymouth Rock in Massachusetts in 1620. He was one of those first 100 pilgrims to come to our country, over half of whom would die in the first year of establishing the colony. Also, he was one of the signers of the Mayflower Compact which is often considered the first instance and precursor of the colonists asserting their own ability to rule themselves independent of the influence of England. This was just the type of thing you dream of when doing your family history! I was related to someone with real historical significance. I even looked into joining the Mayflower Society. The official society made up of descendants of Mayflower pilgrims. There was only ONE problem.....it wasn't true! How could this happen? Well, sometimes when you rely on the family research which has already been done, you can be a victim of the mistakes they made in their research. My Great-Grandmother's name was Elizabeth Fuller born in Portland, Maine in 1886. I had no idea what her parents’ names were. However, the Family Trees I found identified her parents as William Fuller and Helen Waterhouse Fuller (based on several family trees). William Fuller was only 8 generations removed from Samuel Fuller. This all looked right to me and I started researching even farther back than Dr. Samuel Fuller to see how far back I could trace my family tree. However, problems started to crop up. I kept researching and eventually came across a marriage record for Elizabeth Fuller, but it stated that she had a different husband. Doing some additional research, I ended up finding two women named Elizabeth Fuller born within months of each other in Portland, Maine. Uh, oh, this could be a problem. How was I to know which one was my ancestor? I decided to see if I could get a copy of Elizabeth Fuller's obituary to see if that could shed some light on who her parents really were. I knew that Elizabeth Fuller died Sept 23, 1971, but I didn't have a copy of the obituary. I contacted the State Library of Maine to obtain a copy (more on the variety of great genealogy resources that are available from Maine in future posts). Long story, short. The obituary identified her parents as James Fuller and Margaret Armstrong Fuller. Not a match. So, at least for now, my dreams of being descended from the Mayflower pilgrims are dashed. So far, I have traced my ancestors, on my father's side, back to the 1750's in Nova Scotia. My cautionary tales isn't meant to suggest you shouldn't trust the work that other Ancestry.com contributors have done…but as Ronald Reagan used to say "Trust, but verify".